Our choice for the best cat bed, the Petsfit Booster Seat, might surprise a few people. Read on to find out why we loved it so much. Cats look to always be living a life of luxury, but purchasing the best cat bed can make the world of difference to your cat’s overall wellness and comfort. In our experience, the best cat bed for comfort is the Petsfit Booster Seat. It’s an odd choice (we know) but read on to find out why we think it’s the best purchase. For kittens the best cat bed is an enclosed cave bed to help them shelter from any loud noise and offer a sense of security that open beds can’t provide. Let’s justify our choices above and also take a look at what other products the market has to offer. We’ve tried our hardest to fairly review these cat beds based on a combination of personal experience and consumer reviews from around the web. We’ve taken value for money into consideration to provide a healthy ranking that will help you make the right decision. Comfort was the biggest factor in our decisions here, so rest assured that any of the cat beds below will be perfectly comfortable for either kittens or adult cats. Below is our list of the best cat beds around, suitable for both winter and summer seasons. Okay, a booster seat / bed hybrid might be a strange choice for the best cat bed available, but hear me out. It’s soft, firm and elevated. Elevation is something that cats really appreciate. The plush liner (so so soft) is removable and machine washable, meaning that the bed remains usable while any spills or accidents are being cleaned up. The liner is also reversible, with a light smooth side for summer and a fluffy side for winter. This is something that most other cat beds can’t offer. And if that’s not impressive enough… it doubles as a car seat for travelling with your cat! It even has side pockets to keep small toys and treats to keep your furry friend entertained when on the go. It features a leash clip for times when you can’t risk them making a run for it, but we found it best to let them roam a little. They tend to quickly make it back to the safety and comfort of the soft lining anyway. It’s also available in a front-seat variant, though it’s much smaller and probably not quite capable of housing a large cat comfortably. Seriously though, this is a super high quality cat bed and the added bonus of being a car seat is just that, a bonus. It’s a perfect open bed for cats to nap on. The best on our list for it’s versatility and comfort. Perfect for both seasons due to the double lining, and the build quality is outstanding. We struggle to see how any cat wouldn’t love this bed. Check out more reviews and consumer experiences with this product using the button above. 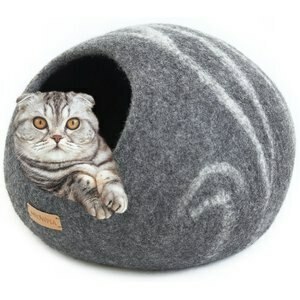 This beautiful cat cave from Twin Critters is made from merino wool, making it irresistibly soft. Each bed is handcrafted using only the best 100% all-natural wool from New Zealand. It’s entirely chemical free and it’s unbelievably cozy inside. In winter months you’ll be amazed at how much heat these retain when it use. Pop your hand in to stroke your pet and you’ll notice that the bed stays warm during even the coldest of nights. If your cat prefers to lie on top of things rather than inside them, you can easily flatten it down to a create a curved bed that two cats can fit on. Ours preferred the bed to be flattened and placed need a doorway where plenty of breeze could reach it during the summer months. t also comes in a variety of colors, including some neutral colors if you aren’t a fan of bright blue. To see some pictures of the bed flattened and the other colors available, hit the button above. Very similar to the previous bed, this cave cat bed is also made from 100% merino wool. We can’t get over how modern and stylish these cat beds look, and while this cave is slightly smaller than the Twin Critters bed above, it seems to hold it’s shape a little better. 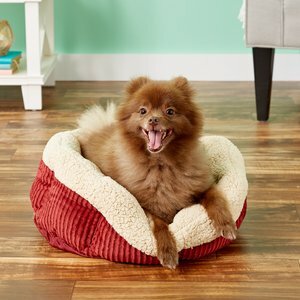 It’s smaller size when compared to the Twin Critters bed is suited well to apartments without much floor space. They’re both worthy contenders for the title of best cat bed around though, it really is just the size difference. If you have just one cat who likes enclosed spaces, then this is the bed for you. If you have two, or an exceptionally large cat, we’d recommend you opt for the bigger, more spacious Twin Critters bed above. Something a little different to your traditional bed, this cat-headed scratcher bed is a mix between a scratch post and a cat bed. Bonkers, right? It’s received outstanding reviews across the board and it’s (surprisingly) much bigger than it seems in the photos. It looks absolutely gorgeous from the outside, and the inside is made of fairly durable cardboard that your pets can happily ruin (instead of your furniture!). We think it might be the best looking cat bed we’ve ever seen. Read some of the reviews by clicking the button below, you’ll be amazed how popular this scratcher/bed has been. This self warming cat bed from aspen offer the best value for money of any cat bed on this list. By far the cheapest cat bed on our list, the 19″ version is more than big enough for even the largest of cats. It’s super squishy and soft, but a little awkward to keep clean. The surface is made from a self-warming material that reflects your cat’s own body heat though, so it stays warm all year round. An ideal cat bed for those on a tight budget. It’s no secret cats love a good snooze. As a matter of fact, the average cat can spend up to 16 hours a day sleeping! What a life, eh? It’s also common knowledge that cats are notoriously fussy. The last thing you want to do is buy a cat bed only for them to turn their nose up at it and never look in it’s direction again. When buying a cat bed, you want to focus on one that offers the best comfort and safety. 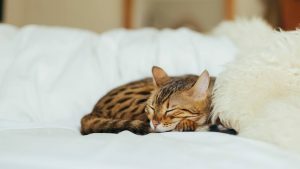 Providing a safe space for your cat to sleep in will make sure they get the best sleep possible and will prove to be a worthwhile investment for any cat owner. The best cat bed differs entirely on your kitty’s personality. If your cat is constantly on the hunt for warm spots to settle down in, then look for heated beds. Alternatively, you may want to read our post on the best gifts for cats where we explained how the SnuggleSafe Heated Pad can turn any old bed into a warm haven. If you have a cat that loves high vantage points and often sleeps on top of furniture, then it’s best to opt for an elevated bed. Most cat trees and scratching posts offer high up cradles and perches that are perfect for cats that like to sleep high up. In general, you should pick a cat bed that you think suits your cat’s personality best. No one knows your cat better than you do, and buying with their preferences in mind is the only way to guarantee a good reaction from them. They come in many shapes and sizes, each with their own pros and cons. 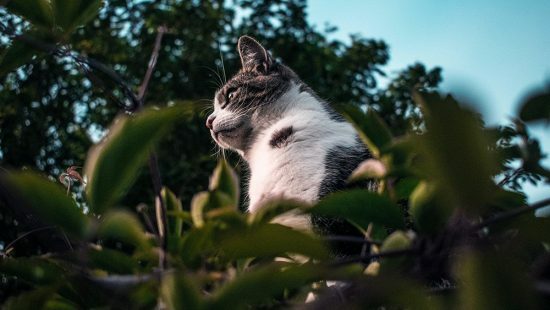 While cats’ needs differ drastically from cat to cat, we’ll give you the lowdown on the benefits of a few popular styles. Rated amongst many as the best cat beds you can get, enclosed cat beds offer a sense of security that’s hard to rival. The pod like style usually comprises of a small entry hole and a soft, padded interior. When coupled with a pad heater they can offer cats a safe warm place to sleep during winter months. The Twin Critters Merino Wool Cat Cave we reviewed above is a fine example of a high quality enclosed cave bed. Heated beds are most commonly sold with a removable heat source. They offer warmth and are ideal for use during the cold seasons. We generally don’t recommend electric heated cat beds. Though all major retailers would only sell approved safe heaters, we feel like there’s just too much of a risk of overheating. Remember, you can make any bed heated using a microwaveable head pad, so it usually isn’t worth shelling out for a radiator bed. The classic shape for pet beds. Basket beds are wide open and cats usually prefer to curl up tightly into one of the corners. While most cats (in our experience) tend to prefer slightly enclosed spaces, many respond well to basket beds too. They’re usually the cheapest of the options and since they’re suitable for both cats and dogs, might be worth a try during summertime. Look for cat beds with comfortable fabric. Your cat’s comfort should be the number one priority when buying a bed, else you’re likely to find that they won’t go near it and you’ll have wasted your money. Common comfortable fabrics include fleece, faux fur, velvet and cotton. You don’t want a bed that’s too big for your cat. I’m sure you know from experience that cats love tight spaces (cardboard boxes!). Small spaces provide a sense of security, and closed cave beds allow cats to sleep safe in the knowledge that nothing can sneak up on them! Ok, this one’s more about you than the cat. But cleaning cat beds isn’t something that I particularly enjoy, so choosing a bed that’s easy to clean is paramount to ensuring it stays that way. Beds with removable covers are your best bet as you can usually sling them in the washing machine and forget about them. Be sure to check the washing instructions as it will differ depending on which fabric it’s made of. Remember, cats are naturally suspicious and careful. It will take time for them to adapt to new elements in their environment and become comfortable enough to sleep in them. Leave them to explore and work it out in their own time. Don’t try to force your cat as it will only make things worse. Keep the bed in a quiet semi-social area so that they aren’t alone but also aren’t disturbed constantly. Some cats prefer higher places to sleep, so maybe look at placing the bed on top of some furniture they usually lie on. If you’re having real trouble getting them to use the bed, try tempting them in with some treats or by placing some familiar toys inside it. This will help them to realize that it’s a warm safe place they can rest in. Get notified of exclusive deals, product recalls and shiny new stuff! A scratching post needs to be durable, safe and attractive to cats in need of a good scratch. We've scoured the web to bring you the best in class. Looking for a modern cat tree that can keep a few rowdy cats happy at once? Need something stylish? We've got your back. 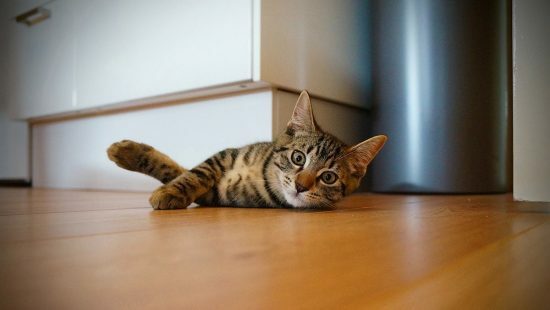 Hours of research have shown that the standout contender for best cat hair vacuum is the Roomba 650 Robot Vacuum iRobot, we look at it in more detail and ponder some cheaper alternatives. When recommending our favorite products, The Idle Cat may direct you to retailers that provide us with a small commission on any resulting sales. This comes at no extra cost to you and does not affect our opinions on product quality. You can read more about which programs we participate in by clicking here. The Idle Cat is not a medical resource. Do not disregard advice from a professional veterinarian because of something you read here. The Idle Cat is using cookies to help give you the best experience. Got it!